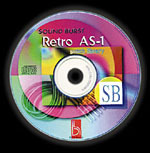 Released by BitHeadz, the Retro AS-1 Patch Library by Sound Burst is a hot collection of 384 patches created specifically for your BitHeadz Retro AS-1 series software synthesizer. Sound Burst's renowned specialist in analog synthesis. Warm pads, pumping basses, striking leads... everything you could possibly ask for in a flexible synthesizer is included in this library. The library comes on a Mac/PC double format CD-ROM and is compatible with the BitHeadz Retro AS-1 series software synthesizer only. The Retro AS-1 Patch Library is already included in the 2.0 release of BitHeadz Retro AS-1. ©Copyright 2005 Sound Burst. All rights reserved. All other trademarks are property of their respective owners.